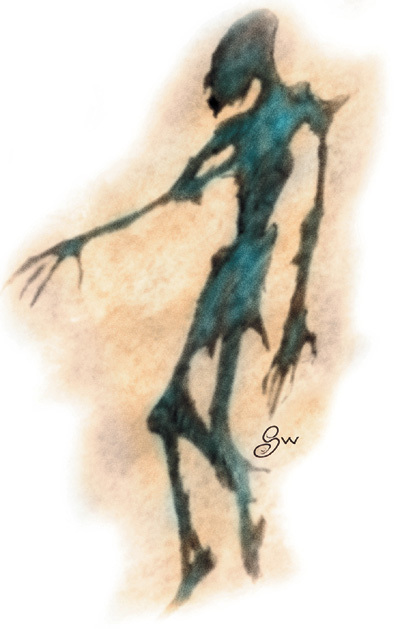 Although shadows seem to resemble ghosts, since they have no corporeal body and resemble shadows, but they are not truly undead creatures. As a consequence, shadows are not susceptible to the cleric ability to turn undead. Shadows may only be struck with magical weapons. The party basically had no choice but to run after being surprised and taking heavy losses (the lone party cleric made a wisdom check and advised us all to run). In retrospect, it was foolhardy to break down a bricked-over door, both from a “something bad is probably contained behind this door” to “let’s make tons of noise and attract some wandering monsters”, and in the end we were appropriately spanked (and we all had a good laugh about it afterwards). It drove home not just the tactical mistake but the fact that old-school means the challenge is not always geared to the level of the party, and you ignore the clues that powerful foes may be present at your peril. Of course, in a previous session a bricked-over door hid not monsters but treasure, a lucky break that added to the party’s complacency. We’ll all probably be much more cautious in the next session. I’m curious to hear of your tactical mistakes, and if they led to disaster or not.